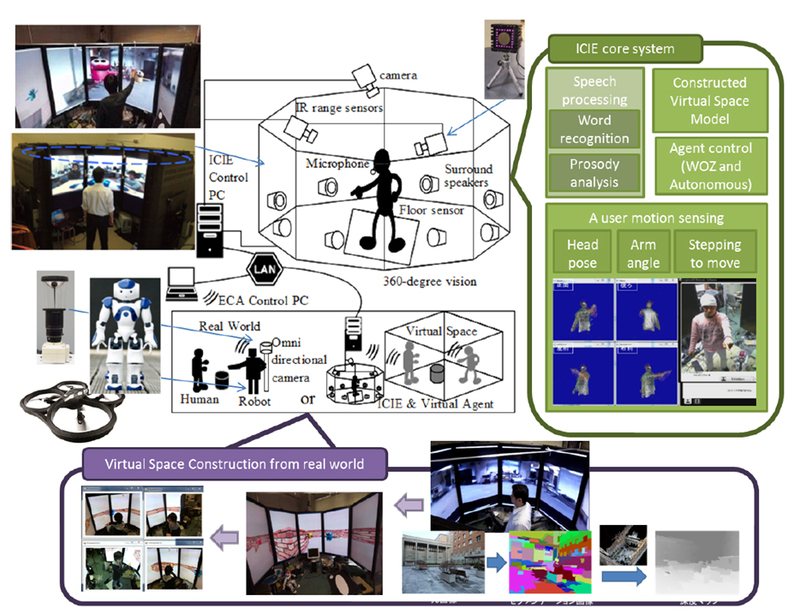 We are developing ICIE (Immersive Collaborative Interaction Environment) in which a person can interact with ECAs controlled by the captured behavior of another person (Fig.1) . By using this system for WOZ, we are able to gather and analyze the communication behavior needed for realizing effective human-agent interaction (Fig. 2). ICIE is composed of an immersive display, which reproduces a 360-degree image around an ECA, infrared range sensors, cameras and speakers. The system can capture human behavior, such as head direction, posture of the upper body and 3D angles of arms, with low cognitive and physical loads in closed immersive environment and the ECA reflects human actions in real time. Yoshimasa Ohmoto, Hiroki Ohashi, Akihiro Takahashi, and Toyoaki Nishida: Capture and Express Behavior Environment (CEBE) for Realizing Enculturating Human-Agent Interaction, In: T. Ishida (Ed. ): Culture and Computing, LNCS 6259, Springer, pp. 41-54, 2010.